If you’re new to the custom planning system known as bullet journaling How to Use Evernote as a Bullet Journal How to Use Evernote as a Bullet Journal There are many ways to use calendars and to-do apps. 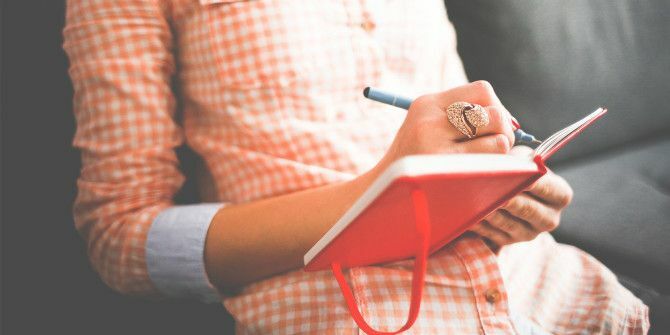 Take Evernote, a journaling system called the Bullet Journal, and no coding experience whatsoever, to create a completely tailored organization system for yourself. Read More , it can be a little overwhelming. Trying to figure out how to set up a planner with nothing more than a pen and a blank journal is no easy task. Luckily, the online bullet journal community is an incredibly active one that is chock full of inspiration. BulletJournal — This is the account of Bullet Journal founder Ryder Carroll, who shares photos from other Bullet Journal accounts. #Repost @aimibujo #bulletjournal ??? EXERCISE TRACKER • I have never done any kind of exercise in my entire whole life but I've been doing a few simple exercises for the last two months (on and off) and actually enjoy it. My goal is to exercise at least three times a week. I was kind of reluctant to post this photo because I've been slacking off a bit this month. Questions: Do you have any tips on how to stay motivated? Also how do you track your fitness/workout in your Bullet Journal? Pinterest is another popular community in the bullet journal community. Just search for the term Bullet Journal on Pinterest and you’ll find endless inspiration. When you click on any image in Pinterest, be sure to scroll down and you’ll see more similar posts. Be sure to check out this list of ways to mine Pinterest for interesting content 7 Ways to Mine Pinterest for Even More Interesting Pins 7 Ways to Mine Pinterest for Even More Interesting Pins How can you be sure that you're uncovering all the amazing content that has been generated by other Pinterest users? Here are essential seven tips. Read More to uncover all the bullet journal the site has to offer. A lot of popular YouTube users share videos at the beginning of each month, sharing how they set up their bullet journal for the month. Search for Bullet Journal or Plan with me and you’ll find a lot of interesting ideas. If you’re getting started with your bullet journal, you definitely shouldn’t get caught up in the embellishments and design. It can be easy to see all these gorgeous bullet journals online and be discouraged from starting your own. Sometimes, a minimal approach is all you need. After all, the bullet journal is simply a system that you can use as a springboard for your own personalized planner. Where do you go for bullet journal inspiration? Let us know in the comments. Explore more about: Bullet Journal, Inspiration.